The result is control over what is delivered and a building system with a clear supply chain others cannot have, which results in a response and understanding that is second to none. We take a partnership approach which builds better buildings, co-ordinated by your Innovaré Systems Project Manager who is the main point of contact that supports you throughout. Our Design Team gets involved with you early in the design, so we can help you get the most out of the unique benefits of our system. This leads to fewer concessions and opens up more opportunities for clever value engineering. We assist wherever possible, for example by providing a full thermal modeling service that can bring a new perspective to the design process. We don’t just have a comprehensive BIM library, but we design in BIM to incredible detail. We produce 3D modeling compliant with BIM processes on request. The end result is super energy efficient buildings and more cost effective construction. i-SIP panels follow the principle of composite material construction to deliver a product whose load bearing capacity, structural integrity, hygrothermal, fire resistance and acoustic performance exceeds those of any individual components within the system. Our specialist manufacturing facility in Coventry is a result of serious investment and R&D in manufacturing systems. Hi-tech production lines take construction from the building site to a highly controlled environment overseen by professional line operators. CNC drill technology driven by industry leading software now gives the flexibility to create the bespoke elements that bring value to your design. All materials are sustainably sourced and manufactured under the international chain of custody schemes PEFC™ and FSC®. Delivery is carefully scheduled to match assembly to reduce build times and minimise storage on-site. A clear project management schedule is made available to everyone – architect, main contractor and clients – along with detailed drawings and structural calculations supported by British Board of Agrément (BBA) certification. Our off-site delivery programme offers a more robust and predictable procurement route, less affected by macroenvironmental factors such changing market conditions over time, on-site materials and labour supply and risks which can affect how and when sites may need to be developed. Therefore, we can respond fast to changing local needs and circumstances. installation teams, building long term relationships which ensure a smooth installation process on site to suit programme. Our teams are CSCS accredited experienced SIP installers, with SSSTS team leaders, CPCS lift supervisors, slinger banksmen, First Aid training and relevant training to suit on site fall arrest systems. 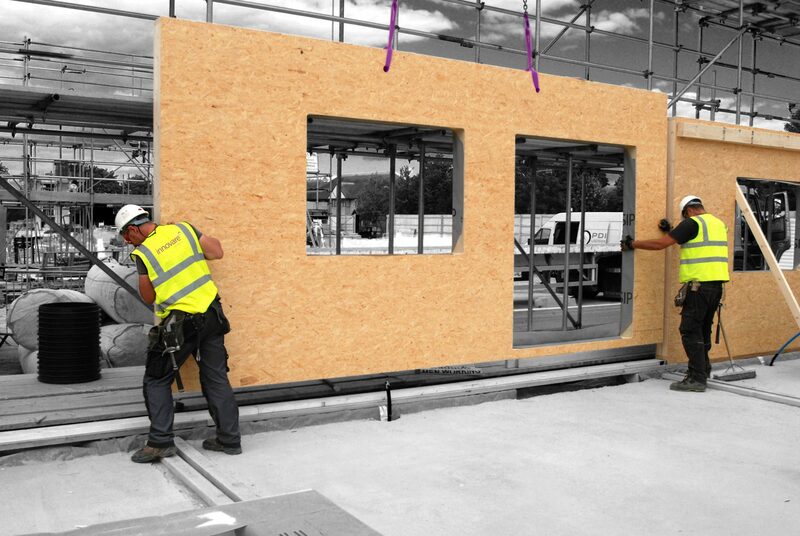 SIPs are prefabricated, high performance, lightweight building components used in external walls and roofs. The panels are made by sandwiching two layers of orientated strand board (OSB) structurally adhered to a core of Expanded Polystyrene (EPS). SIP walls can bear considerable vertical and horizontal loads with reduced internal studding. The load carried by the SIP is transferred to ground by the OSB skins, held in position by the insulation core. It’s a system that is extremely strong, energy efficient and cost effective to use. Not to mention quick to assemble on site. Challenging Building Regulations and Government strategy for low and zero carbon building means higher standards for insulation and airtightness are guaranteed. Fabric energy efficiency standards is now an essential part of the equation, demanding much more of the industry and driving the market for SIP building systems. It’s simple. Highly insulated buildings keep heat in. Low carbon construction – throughout the building envelope – needs insulation, airtightness and junction performance, as well as the balancing required from building services and ventilation. The Fabric First approach enabled SIPs puts sustainability and energy efficiency into the heart of the design. We can build for any desired thermal performance, achieving U-values as low as 0.10W/m²•K. 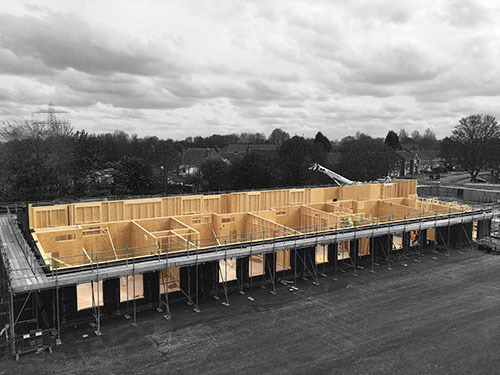 Our i-SIP building systems provide the complete dry structure of the building including internal and external walls, floors, trussed and panelised roofs. We are also able to supply scaffoldless installation with edge protection in some cases depending on site factors. SIPs are often specified as infill to steel, concrete or glulam timber frame structures, and can sit inside or outside the frame itself and therefore take out frame cladding. This method of infill walling is incredibly fast to install, making it an innovative solution for speeding up high rise construction. They reduce thermal bridging, making them a great alternative to traditional SFS Steel Framing Systems. Large format panels offer a highly cost-effective infill solution for a variety of finishes.